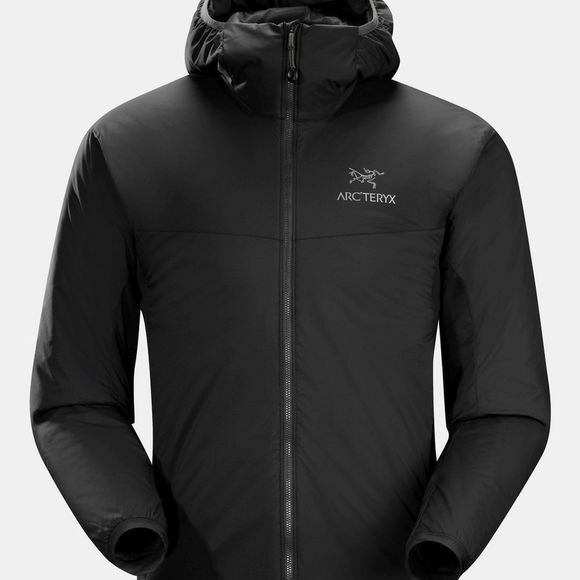 The Mens Atom LT Hoody from Arc'teryx is designed as an active-use insulation layer, providing vital core warmth with liberal mobility and breathability. Lightweight and compreShort Sleeveible, the Atom LT Hoody features Coreloft insulation in the torso, arms and hood. The side panels and underarms feature Polartec Power Stretch with Hardface Technology, delivering stretch mobility and breathability. A wind and moisture resistant outer shell extends stand-alone usability. The benefit of taffeta fabrics is their light, airy nature with an ability to turn aside wind. The Atom series have a taffeta outer lining that is treated with DWR (durable water resistant) finish to give them a long-lasting ability to shed moisture. In light precipitation, the Atom LT can be worn as an outer layer.